One of the many things I love about my apartment is that it has a balcony with a gorgeous view to the park that sits behind our building. It is very peaceful and offers beautiful sights to see. This is especially true during the Fall because I get to see all the leaves change color. You guys must know by now I love everything that has to do with Autumn. The change of the leaves, Fall-specific food and drinks, and the nice breeze. 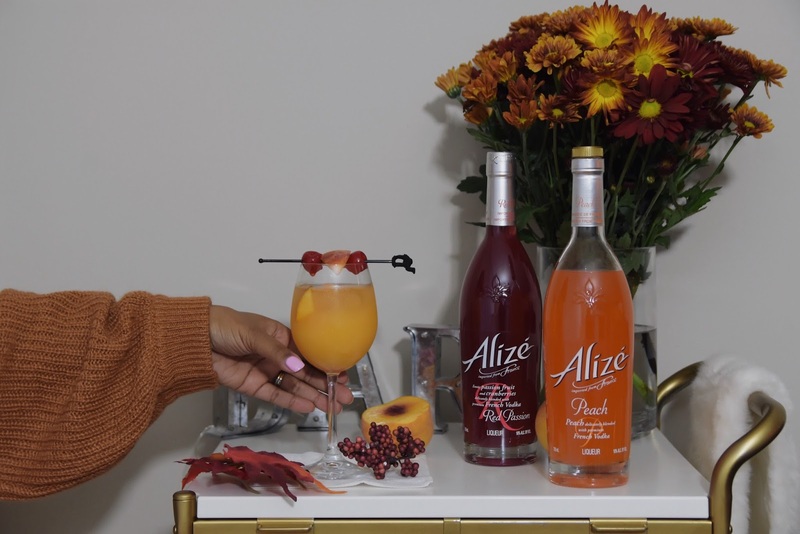 I partnered up with Alizé this Fall season to share my favorite Fall cocktail. You guys will absolutely love this one! Alizé has been one of my favorite drinks for as long as I could remember. It is a personal favorite of mine because it has a nice blended flavor and easy to mix with spritzers, fresh juices, and mixers. Alizé is infused with premium French Vodka and fresh flavors. The two flavors I got were "Red Passion" and "Peach". I created a cocktail with the peach flavored one, and I called this drink Autumn Sunrise🍂. A perfect drink to enjoy from my balcony while thoroughly enjoying the fall weather. Can I just say these two Alizé bottles were perfect for my bar cart's fall decor!? The colors match just perfect! I'm one of those people that is obsessed with a bar cart and I love to change it up for every season. Thanks Alizé for adding a nice colorful and decorative touch of fall to my bar cart. Life is more fun in color! Now.... let's get into that cocktail recipe because it's Happy Hour somewhere! 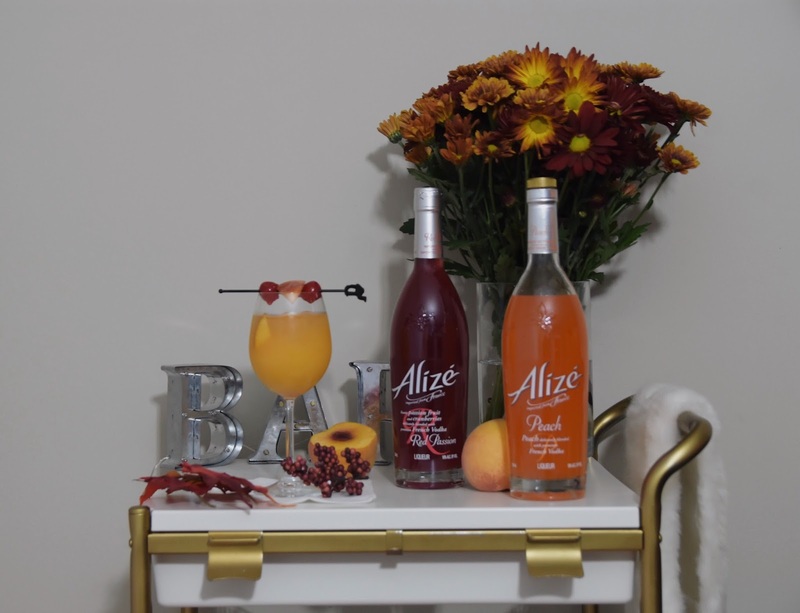 Hope you guys try out this easy drink recipe with Alizé: if you do, make sure to tag me on social media and let me know how you like it. I love Alizé, is one of my favorites drinks ever! And how much I love your balcony, I think we can have a fall party there. This looks delicious! 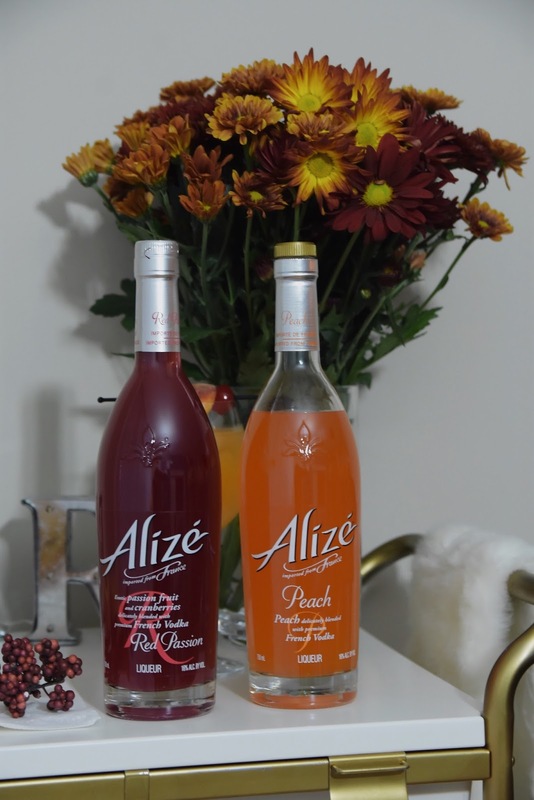 I just got some Alizé in the mail and am so excited to try it! Ugh they are so good and a nice fall refresher! Ok, this drink looks amazing!! I need to try these out! Oh that cocktail looks amazing! Vodka is my drink of choice and these sound so delicious! I will definitely have to look Alize up and whip up a cocktail!! Definitely give it a try they are pretty good! This is such a cute fall look! And I'm loving the dranks!!! These drinks sound so fun and delicious! This cocktail looks incredible. Definitely going to be trying this out.